Supplying the additional water will also not affect Singapore's water supply in the short-term. This year's dry spell has reduced the water level at the Linggiu dam, which dropped to 35 per cent last month. Water rationing has been carried out since last month in the Mersing and Kota Tinggi districts. Malaysia's water services chief Mohd Ridhuan says water cuts in Johor Baru and Pasir Gudang are highly possible if the situation at Sungai Layang dam does not improve. But PUB warned that the dry weather was cause for concern as it has affected water levels in the Linggiu Reservoir, which dipped to an all-time low of 33 per cent from 40 per cent in April. The reservoir is operated by PUB and improves the yield of water from the Johor River, from which both Johor and Singapore draw water. "PUB is monitoring the situation closely," it added. Despite facing its own shortages, Johor's state minister in charge of public works pledged last month that it would continue to supply water to Singapore. Under the 1962 Water Agreement, PUB is entitled to draw up to 250 million gallons of water from the Johor River daily. In return, Johor is entitled to a daily supply of treated water of up to 2 per cent - or five million gallons - of the raw water it supplies to Singapore. Over the years, PUB has - at Johor's request - supplied about 16 million gallons of potable water per day to Johor. The last request by Bakaj from Aug 14, 2015, to Jan 8 this year saw PUB increasing its supply by an additional five to six million gallons - similar to the current arrangement. "We remain committed to working with Bakaj and relevant agencies to ensure a reliable supply of water for both Singapore and Johor," PUB concluded. From this article: "Operations halted at 3 Johor water treatment plants due to high ammonia levels: Report"
[One of the complaints from M'sia is that even though they supply (raw) water to Singapore, they end up paying Singapore for (treated) water. If they buy just the agreed amount - 5 million gallons, at 50 sen per 1000 gallon, they would pay 250 thousand sen. Singapore buys 250 million gallons at 3 sen per thousand gallons. We would pay 750 thousand sen. So sticking to the agreement, we would pay the Malaysians 500,000 sen per day. BUT, Johor currently draws up to 16 million gallons a day on a routine basis and so would pay more than 750 thousand sen. per day. The net effect is that Johor pays us for treated water even as they sell us raw water. And when they ask for a temporary increase in treated water, and we comply, we send them a bill for the extra treated water, and they pay us more. Because they save money and they make money. From the booklet "Water Talks" (2003? ), it cost Singapore RM2.40 (then) to treat 1000 gallons of water, and we sell it to Johor for 50 sen. That's a RM1.90 subsidy per 1000 gallons. Johor buys currently 16 mgd - million gallons PER DAY. That's about RM30,000 subsidy per day. Johor then sells the water to their residents for about RM3.95 per 1000 gallons. They make RM3.45 per 1000 gallons from the water they buy from Singapore. Cheaper than to do it themselves. And that is why they chose NOT to review the price of the water agreements in 1986/87 because any revision of the raw water price would also lead to a review of the treated water price. So their "generosity" and goodwill in not curbing water during their drought? Yes, Singapore draws water from the Johor River. Under the 1962 agreement Johor can draw up to 5 mgd of treated water. But they have raised their drawings up to 16 mgd. Why? 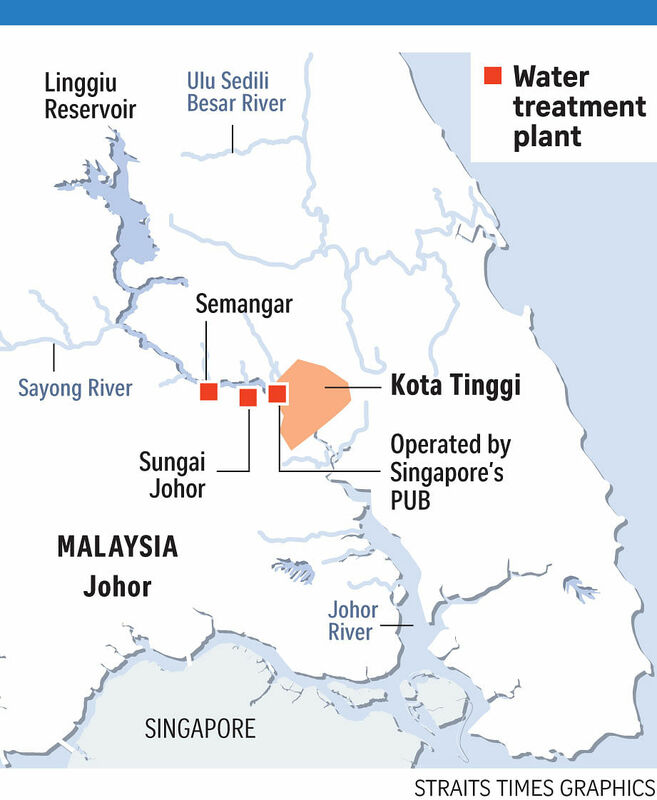 There are two water treatment plants on the Johor river operated by Malaysia, in addition to the one run by PUB (SG). The Semanggar plant has a capacity of about 40 mgd (159.1 mld). I have not been able to find info on the capacity of the Sungai Johor State Waterworks plant. However, in 2001, in correspondences between Lee Kuan Yew and Mahathir, the Johor River capacity was 313 mgd, and Malaysia draws 70 mgd while Singapore draws up to 250 mgd. Which means that the Sungai Johor plant would be about 30 mgd. And they get 16 mgd from Singapore. If they cut SG from the raw water supply, it is not like the Johor State water treatment plants would have the capacity to supply more water for Johor residents. As it is, their two waterworks supplies 70 mgd. Maybe 80 or even 100. Whatever their capacity, they need 16 mgd from Singapore on an ongoing basis. And in these times of drought, they need about 6 mgd extra. This tells me that whatever their capacity, they are unable to meet demand with it. Cutting the supply to SG will not solve their problem, as that will only increase the supply of raw water, but they are unable to increase the supply of treated water, which is what the residents require. In fact by adhering to the water agreement, Johor can continue to be supplied with subsidised water by Singapore. The point of this is NOT to point out the self-serving nature of their "largesse". Or that they have an ulterior motive. They are not doing anything that we, in their position, would not have done. Your people are thirsty. Do what is necessary. The point of this "expose" is not a revelation that our PUB is dumb to have fallen for such an obvious spin. If I can figure it out, I am sure they are aware of the advantage to Malaysia. We are keenly aware that we are subsidising their treated water (but those are the terms of the water agreement). We are also aware that the Malaysian need to save face, so sure, we will play along and not embarrass them (if they don't read this blog). When your neighbour claims that his wife is the most beautiful, and his children are geniuses, you nod and respect his opinion without challenging or giving offence. Of course, if your neighbour is a good neighbour, he won't say such silly things to you when your wife is obviously the most beautiful, and your children are talented geniuses.